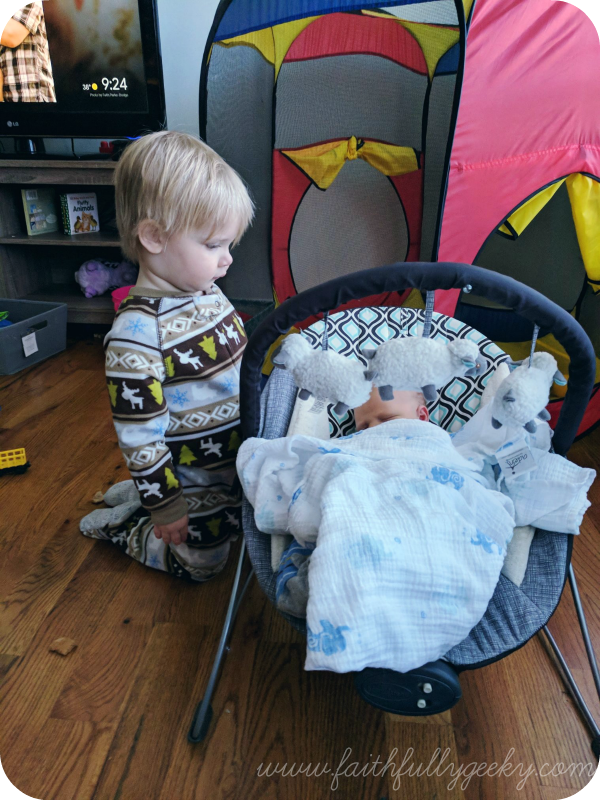 This week I have spent a lot of time going through Pasha's clothes and pulling out things for Stormy to wear. 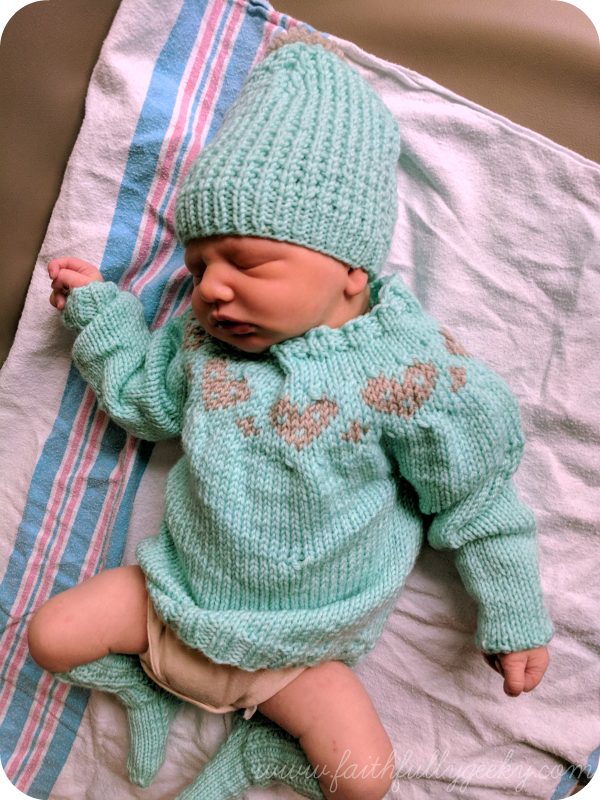 This includes finding all of the knitwear I made for him that I am hoping to get more wear out of and therefore justify the pitiful amount of knitting I have done specifically for this kid. Because I kept all knitted items together, I rediscovered this year's holiday sweater which I managed to put on him for pictures, clean, and then forget about. Because that's how my brain works right now. One of my favorite items I knit before Pasha was born was his Milo vest. I knit it out of Leading Men Fiber Arts Dramaturg DK, and it has held up so well that when they released their Winter Wonderland colorway I knew I needed to knit him another. I knit the eighteen month size and used the braided cable option. I love the way this cable chart works up and the look of the various pops of color in the cable versus stockinette versus garter stitch. And yes I know, it's hard to see the details in these photos. I'd apologize, but it's basically impossible to get a toddler to hold still when there are puddles about. It turns out that vests really are perfect sweaters for our North Carolina holiday season. These pictures were taken at my parent's house when we were there the weekend before Christmas. It was 50+ degrees out and rainy most of the time. Luckily when the power went out for a few hours (squirrels, man, they're a killer), the skies had cleared enough for puddle jumping. Wearing a vest meant that Pasha stayed warm while he played but I didn't have to worry about sleeves ending up in the mud. 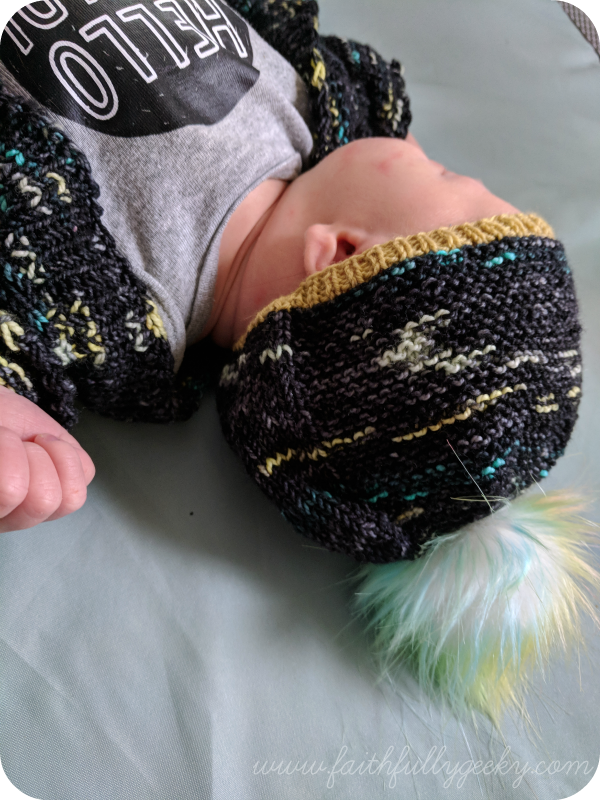 I imagine I will knit several more of these in the future as the boys grow up. There's a chance I'll try to use a different yarn, but the Dramaturg has held up so well to washing that I might just have to make one in every color. You might have heard that we had a bit of winter weather here on the East Coast. They're calling it a "bomb cyclone", and if you weren't hit by it you are probably tired of hearing people discuss the record temperatures, snow fall, and all around gross winter weather. We were fortunate enough (or not depending on your perspective) that all we saw in our area was a light dusting. Schools closed, people's pipes froze, but we did not have hurricane-style snow like they did in other parts of the storm's path. In general, we just had a nice holiday. The best part was that the little bit of snow we did have was actual snow. Now, if you are from anywhere that sees regular snow fall you are probably rolling your eyes, but I have to make this clarification. I've lived my entire life in NC and the majority of winter precipitation we get is freezing rain and ice. When we get snow it's almost always over a thick layer of ice, which is why we close down and stay home. Snow is awesome. Ice? It's a broken ankle and overturn vehicle waiting to happen. BUT! This time our little bit of snow at our house was entirely snow. No ice! If we'd had a real accumulation I'd probably still be playing in it. As it was we got to take Pasha outside and let him really play in the snow rather than carefully carry him out and place him in the yard. I honestly did not think that we were going to get anything because I had just finished knitting myself a new hat the night before. For Christmas Chris and Paul got me one of Home Row Fiber Co's portable yarn bowls and filled it with a skein of Spun Right Round Worsted (Clairvoyant) and a faux fur pompom. As soon as I finished my final FO of 2017 (the Half Moon Oracle, which I will eventually block, I swear) I wound up the yarn and cast on my first project of 2018. I had intended to knit the Shannon Cook's Tread in some Happy-Go-Lucky HGL Worsted to match the Onward Shawl I knit last year, but when I started looking for a worsted hat pattern I could not get it out of my head. Honestly, it was easy enough that I might just knit a second. The pattern calls for US 8s for the ribbing, but I could not find mine so I knit it with US 7s instead. It fits perfectly (I knit a size medium). I've noticed that when I knit ribbing on my hats they tend to be a little looser than I intend. I'm not sure if this is because I knit ribbing looser in general or if it is an unintended consequence of hats always being too tight when I was a kid. I like to think I've grown in to my big head, but I always have it in the back of my mind that my head is too big for hat patterns. Overall I give this five stars and I really want to go back and buy more pompoms to make all the hats. The combo of the fun speckles and the more subdued pink makes me really happy. Now if I could just get myself to knit on the things I'm supposed to be working on.